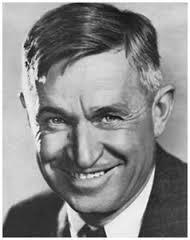 Today in Masonic history William Penn Adair "Will" Rogers passed away in 1935. William Penn Adair "Will" Rogers was an American entertainer. Rogers was born on November 4th, 1879 on the ranch owned by his parents called Dog Iron Ranch. The ranch was in Indian Territory, Rogers himself was a little more than one quarter Cherokee. His father was very prominent in Cherokee society. Rogers mother passed away when he was 11. Rogers did not get along with his father and the passing of his mother did not help the situation. The two would start coming closer together after Rogers first made it in vaudeville, his father would pass away before a full reconciliation. Rogers at times claimed to a great student and at others claimed that it took him 10 years to read the 4th grade primer. He would drop out of school in the 10th grade. In 1901, Rogers and a friend would leave the United States for Argentina, there they hoped to become farmers. Unfortunately it did not work out and the two men lost all of their money. When Rogers' friend headed back to the United States, Rogers went to South Africa. Some claimed that he went to work for the British Military breaking horses during the Boer War, this would not be the case since the Boer War ended three months before Rogers arrived. He instead would go to work for "Texas Jack's Wild West Circus" as a roper. He would gain a great deal of experience with the circus, before long though Rogers would decide to move on, this time to Australia, working for another circus on the recommendation of Texas Jack. In 1904, Rogers would finally return to the United States working on the Vaudeville circuit. Rogers would eventually go to New York City. At a performance at Madison Square Garden a steer got loose and tried to get up into the stands. Rogers was able to rope the steer. This led to Rogers being featured in various newspaper articles, it also led to a long standing performance at the Victoria Rooftop. Rogers would work in various venues over the next decade. In 1915 Rogers began to appear in the Midnight Frolics put on by Florenz Ziegfeld. Eventually Rogers would become part of the Ziegfeld Follies he would appear in most of the Follies from 1916 to 1925. It was while he was appearing in the Follies that he changed his act from the Ropin' Cowboy to the Talkin' Cowboy. One evening with President Woodrow Wilson in the audience he began talking off the cuff satirizing some of the Presidents policies. He had the President and the entire audience in stitches. From that point on he would became a political satirist. In 1918, Rogers would sign with Samuel Goldwyn to make movies. He would make 48 silent movies, not the best medium for a satirist. He would go to make talking pictures as well, including A Connecticut Yankee in King Arthur Court based on the Mark Twain book of the same name. Many would compare Rogers to Twain in their writing styles. In 1922, Rogers began writing for newspapers and various periodicals. He would also write many books. Starting in 1925, Rogers would go on the lecture circuit traveling around the country and around the World delivering speeches to various groups and at various events. In 1928, Rogers would declare his mock candidacy for President of the United States. He claimed to be running as the "Bunkless candidate" for the Anti-Bunk Party. This was largely an excuse for Rogers to lampoon national political figures, which he did quite successfully. He would make only one campaign promise if elected, that he would resign immediately. After the election, he declared himself victorious and immediately resigned. Rogers became friends with Charles Lindbergh. It was through this friendship that Rogers became an advocate for flight. In 1935, famed pilot Wiley Post wanted to scout for a route from the West Coast to Russia. He enlisted Rogers to come with him. During a heavy storm in Alaska on August 15th, 1935, the two men would set down in a lagoon when they became lost so they could ask for directions. On taking off an engine failed at low altitude. The plane crashed back into the lagoon shearing off one of the wings. The plane flipped upside in shallow water, both men were killed instantly. Rogers was a member of Claremore Lodge No. 53 in Oklahoma.